Get this 17-piece Farberware tool and gadget set for $11.43 with free Prime shipping. That's an average of $0.67 per item. Considering that the can opener alone will probably cost you $3-$4, this is a VERY nice price. 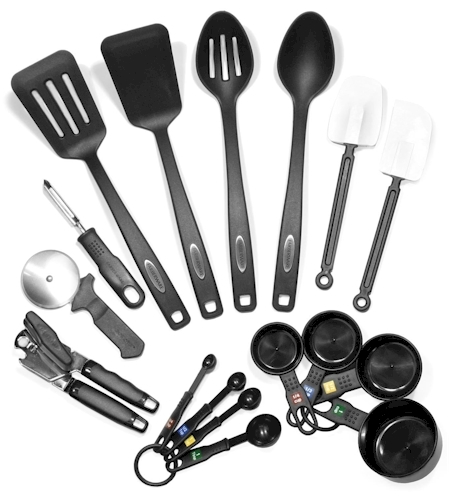 THE 17-PIECE SET INCLUDES: one of each: slotted spoon, basting spoon, turner, slotted turner, spoon/spatula, spatula/scraper, peeler, pizza cutter, can opener, 4 piece measuring cup set and a 4 piece measuring spoon set. NON-STICK: All of the cooking tools included are non-stick; never worry about food sticking to your utensils. MEASURING CUPS: The measuring cups include the measurements of 1/4 cup, 1/3 cup, 1/2 cup and 1 cup. MEASURING SPOONS: The measuring spoon measurements include 1/4 teaspoon, 1/2 teaspoon, 1 teaspoon and 1 tablespoon. EASY TO CLEAN: All items are dishwasher safe with the exception of the can opener; which should be hand washed.